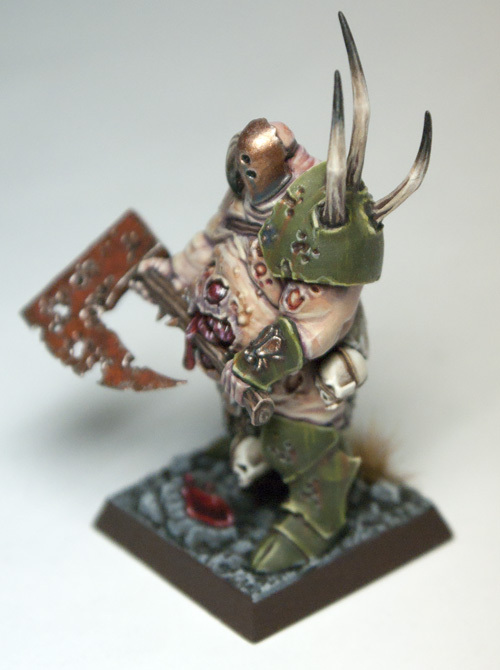 The other day I finished my latest model, the new plastic Chaos Lord of Nurgle from Games Workshop. Now I am a big fan of all things Nurgle, I own a 1,600 point all Nurgle Demon army and a 2,000 plus point Death Guard army and hope to expand into traitor guard when I have the time (so a few years) and I think this model is beautiful. 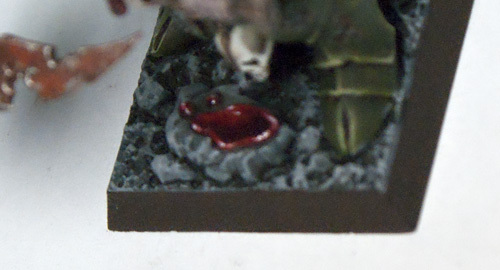 You know, in that its so disgustingly perfect Nurgle way. 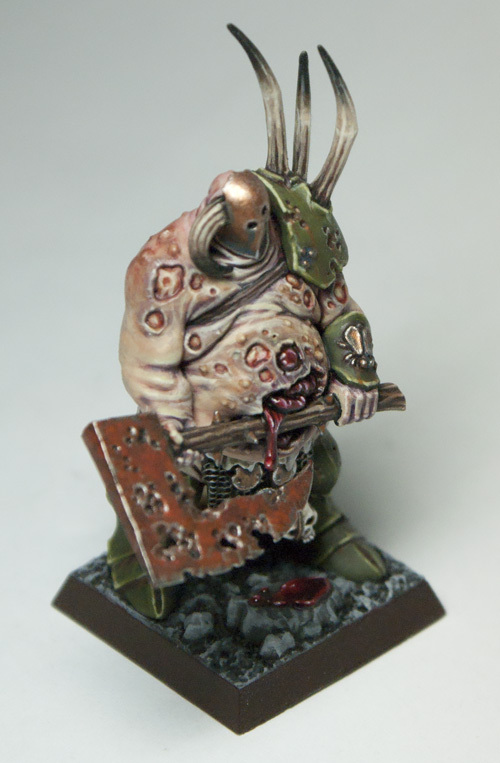 It epitomizes what Nurgle is for me, massive build, check, bloated, check, guts spilling out, check, use of threes, check, giant cleaver, check. 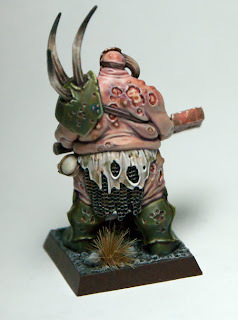 I was so excited to paint this guy that I had my local store put a hold on him when he was released. This is the first of the new all plastic heroes for Fantasy that I have built and I have to say that they are wonderful. Tons of nice crisp detail and easy to put together. 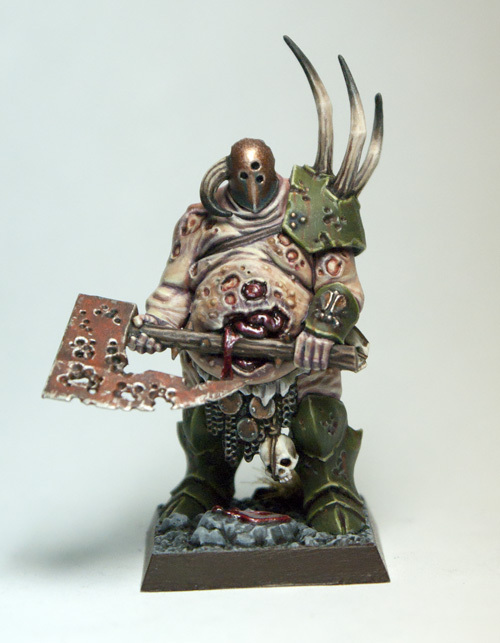 While waiting for this guy to release Games Workshop put out a call for applications to join the 'Eavy Metal painting team and I thought what a perfect opportunity. So this guy became one of my new models I am painting to submit with my application. I put a ton of time into him and I have to say, I hate painting horns, what a pain. 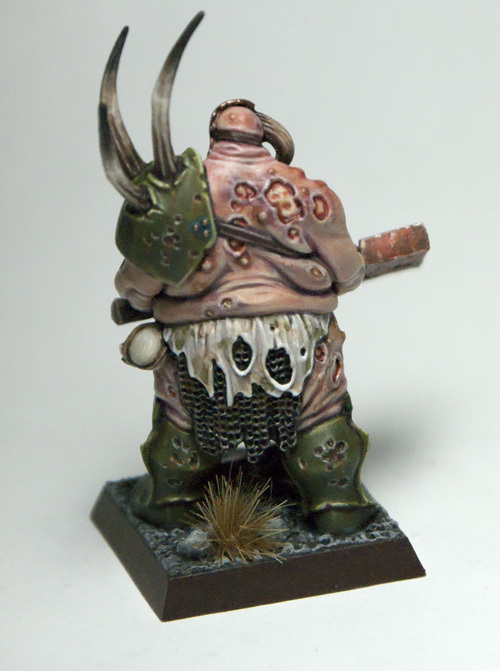 The second new model I am going to paint up will be an Ogre Firebelly, so watch for him within the next week. 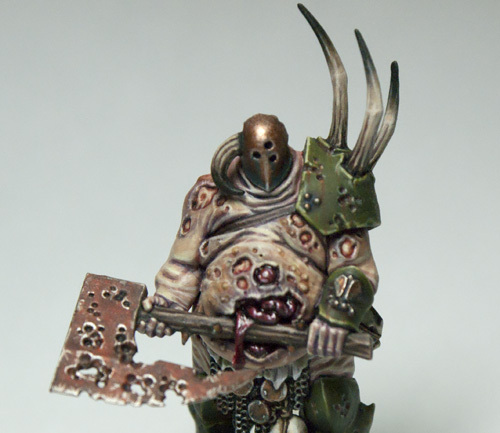 Since this model is going to be part of my submission to Games Workshop I am looking for some real good criticism, whether that's on the painting, basing (he comes with a pre-sculpted base mind you) or the quality of the photographs, let me know where you think I can improve him. Since the application requires 6 models and I am only painting 2 new ones maybe I will post up pictures of the other entries I am thinking of using and you guys can help me decide. I want to stand out of this guys stink radius and poke at him with a stick. lol. Seriously though at first I thought you had posted a GW picture of the model, so I don't think you could do much better than that for an application piece.